Note: Please understand that this website is not affiliated with the Isabey company in any way, it is only a reference page for collectors and those who have enjoyed the Isabey fragrances. The goal of this website is to show the present owners of the Isabey company how much we miss the discontinued classics and hopefully, if they see that there is enough interest and demand, they will bring back your favorite perfume! Please leave a comment below (for example: of why you liked the perfume, describe the scent, time period or age you wore it, who gave it to you or what occasion, any specific memories), who knows, perhaps someone from the company might see it. La Route d'Emeraude by Isabey: launched in 1924. Originally created by Isabey's chief perfumer, Robert Bienaimé. The fanciful name refers to the so-called Emerald Route. The route delivered precious stones and other valuables from the southern regions of Asia, to Iran and the Near East. So what does it smell like? I have no notes on the original 1924 composition, but I imagine it may be similar to the modern formula. Bottle designed in 1924 by Julien Viard, perfume bottle and stopper, clear and frosted crystal, accented with grey patina. Box decorated with scrolling floral motifs. Molded J.Viard. 4 7/8" tall. The perfume was discontinued probably sometime in the 1930s. In 2012, Isabey released a modern interpretation of La Route d'Emeraude by perfumer Jean Jacques and designer Rania Naim. The name was borrowed from the 1920s perfume and was inspired by journeys to the emerald triangle of Thailand, Laos and Cambodia. Top notes: bergamot, rose oil and cinnamon. Middle notes: Sambac jasmine, Moroccan jasmine absolute, orange blossom and tuberose. 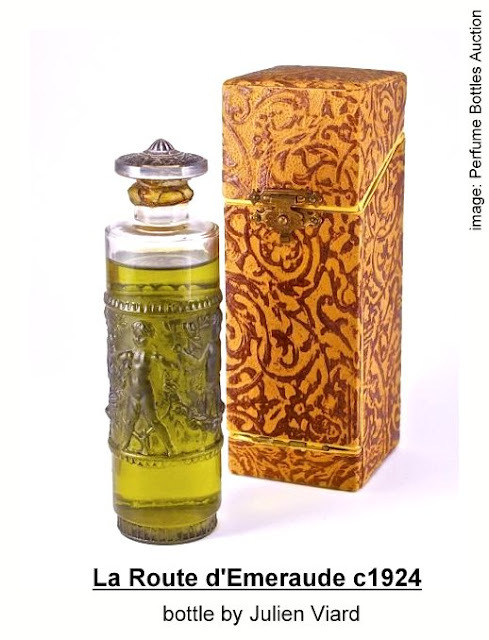 I received samples directly from Panouge for the purposes of completing this article on the modern fragrances La Route d'Emeraude and Perle de La Route d'Emeraude. Wow! This actually smells vintage! The perfumer has created a well blended reformulation of a long forgotten fragrance. When applied to my skin, I get a burst of zesty bergamot followed by cinnamon dusted jammy rose petals. Then, a flourishing white floral pleasure garden appears. Two types of jasmine: the night blooming Sambac jasmine and Moroccan jasmine lend their absolutes to the heart of the fragrance. This pairing of jasmine lends a sharp, green note that compliments the fresh bergamot still shining through to the lusty center of the perfume. The voluptuous tuberose, who's own sweetness enhances that of the orange blossom, suggests carnal opulence. The drydown unfurls a precious ambergris and musk base, enveloped by a sensual embrace of balsamic benzoin and dreamy vanilla. 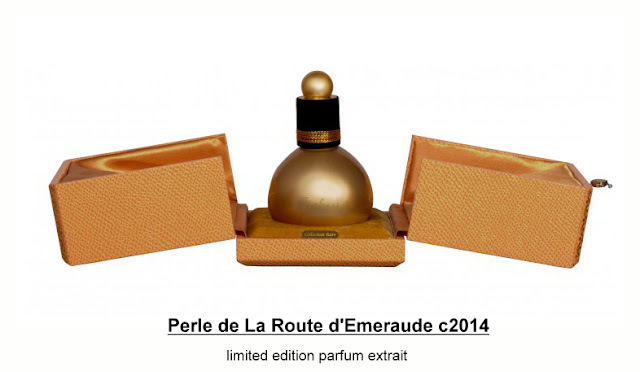 In 2014, Isabey introduced a limited edition extrait for La Route d'Emeraude. Known as Perle de La Route d'Emeraude, the fragrance is housed inside of a 50 ml round flacon based on the 1924 "perle" designed flacon. 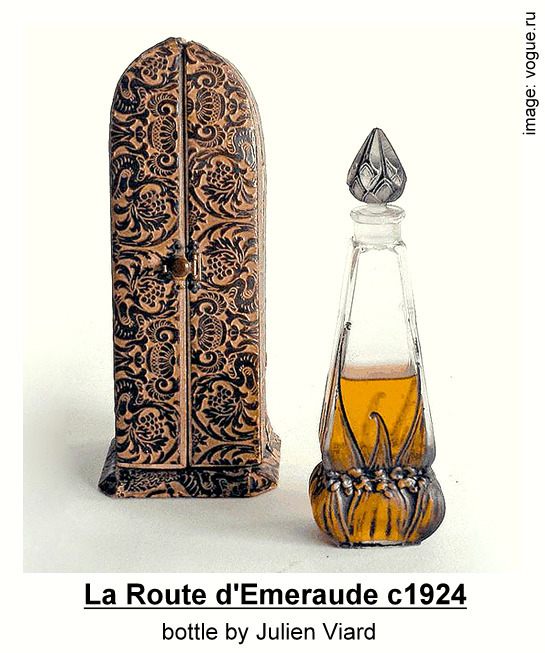 In this case, instead of the pearly nacre that decorated the original 1920s bottles, La Route d'Emeraude is housed inside of an opaque gilded glass flacon. The presentation box is covered in an apricot colored leather and lined with rose gold satin. 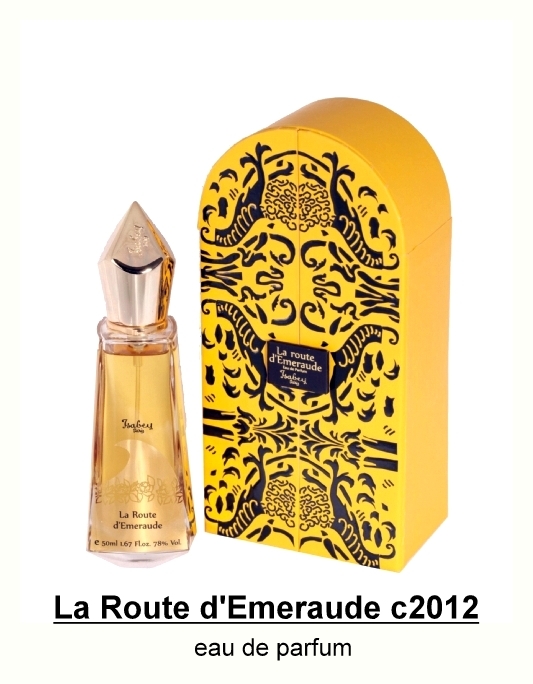 The extrait is a concentrated and intensified version of La Route d'Emeraude. This is a richer, intense version of the former perfume. The fragrance opens with a lush shower of fresh petals. This masterful blending combines honeyed orange blossoms mixed with bubblegum jasmine. Fruity ylang ylang provides a trace of a ripe tropical banana, while bright bergamot lifts the heaviness of the white flowers to give it some buoyancy. A subtle hint of a green rose plays hide and seek amongst the irises. Cinnamon adds a lively counterpoint to the slightly saccharine bouquet. A deep ambery base reveals a balsamic marriage of benzoin and vanilla layered over a powdery, musky base. This would be ideal to be worn for an intimate evening, the perfume begs one to get closer as it stays quite close to the skin with an elegantly restrained projection. What is your favorite Isabey Fragrance? Mon Seul Ami by Isabey: launched in 1928. Copyright Grace Hummel/Cleopatra's Boudoir. I am not affiliated to Isabey Perfumes. Simple theme. Powered by Blogger.